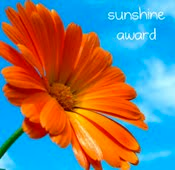 I'd like to think I add "sunshine" to those that visit and read my blog daily. I thank Tammy for this award. This award is traditionally passed on to those blogger's that inspire others and show positivity and creativity, so, in that spirit, I picked my nominees from blogs that I visit regularly and are very informative and inspiring to me. 5) Share the love and link to the person whom you received this award from. Here are my 10 nominees, please visit them and check out their blogs! As you know we all live for comments! Jaminacema @ Just Call Me Jamin! May His "sonshine" light your path! Wow! Thanks so much! I really appreciate this and it keeps me motivated! Congratulations on your award, it is indeed well deserved. I am humbled that you thought to choose me as one of the recipients. Thank You. thanks so much Abi- always good to receive and light up my day!